Although many dealers are enjoying record profits and are optimistic about the future, there may be storm clouds on the horizon. The U.S. automotive market has already begun to recede from all-time sales highs (17.4 million units in 2016). Dealership profits have also begun to decline from the historical highs achieved in 2015 records, although the current financial health of the industry is still reasonably robust. Source: NADA Data Annual Financial Profile of America’s Franchised New-Car Dealerships. Internet sales have increased from negligible levels 10 years ago to 10% of new car sales. These are obviously Dutch auction sales where most customer won’t even come into the store for other than the low bid. Of even more concern is the fact that in the internet age, customers can know everything about dealer cost and rebates on a car, substantially reducing the potential for significant GPPU other than on high-demand short supply models. A number of brands generate consistently negative front-end gross in the new car department and are only made whole when the factory pays rebates quarterly in arrears. We just assisted with the sale of a dealer that experienced $3K of negative front-end gross on every new car sold. Interestingly the factory composite data showed the same pattern for the region. Dealers are rightly concerned about a business model where the new car department is sustainable only by factory subsidies. If the new car department’s ability to generate significant contribution is steadily eroding, one must then ask whether dealers can make reasonable dealership profits that are primarily derived from service and used. Some can but many cannot. The franchised dealership industry has both high financial leverage and high fixed costs, particularly facility costs. It will likely become more of a challenge for dealers with commodity brands to make decent profits in this environment. 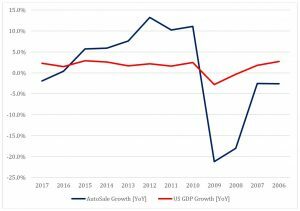 We also know that the auto industry cycles generally coincide with the U.S. economic cycles and that cyclical downturns in the auto industry are considerably more severe than the downturns in the general economy. Specifically, during the downturn in the Great Recession, the peak-to-trough decline in the US GDP was 4.3% while the peak-to-trough decline in US registrations was approximately 36% (16.5 million units in 2007 v. 10.6 million units in 2009). In other words, when the US economy gets a cold, the auto industry gets pneumonia. This risk is independent of and in addition to the risks noted above. 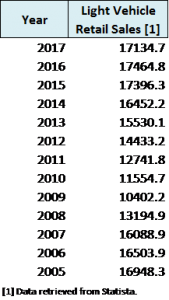 Note that the current expansion is already the longest post WW II expansion at more than nine years. One can make a compelling case that the next downturn has already begun. These economic contractions have a number of consequences for dealers. The first and most critical is that depending on the length and severity of the next downturn, the survival of a number of dealers can be at risk. In preparing for the inherent cyclicality of the industry, prudent dealers ensure that they have significant cash reserves to weather the inevitable storm. The second major impact of significant recessions on dealers is the potential hit to their dealership valuations. It is no secret that dealership valuations are largely based on blue-sky multiples applied to either recent historical, or projected earnings based on MAP and industry benchmarking operating metrics. The chart above shows that just between 2009 and 2017 average pretax profit per dealership grew from $402K to $1.4M. In the event that in the next downturn the profit of the “average dealership” declined back to the 2009 level of $402K, average dealership value would experience a decline of 71%, assuming that valuation multiples remained the same. However, valuation multiples generally do not remain the same in recessionary downturns. Depending on the specific franchise and the severity of the downturn, the valuation multiples may contract by as much as 50% or more. This compounds the valuation shrink for a dealer by perhaps double. At any point in time, a certain subset of the dealer body will be considering selling for reasons including retirement, estate planning, health issues, marital dissolution and liquidity needs for non-automotive investments or problems. For these dealers, a significant recession can force them to choose between selling at a significantly depressed value or postponing their sale for as much as 3-5 years. Note carefully that even though the Great Recession only lasted 18 months, it took six years for US new car sales and dealership profits to fully recover! 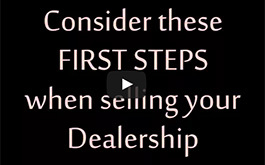 Many dealers can afford to wait it out, but some inevitably can’t. For dealers who are in the business for the long haul, one could observe that now is the time to use record profits to strengthen balance sheets and cash reserves and to focus on dealership operating efficiencies. The dealers who do will be well fortified for the inevitable next downturn. 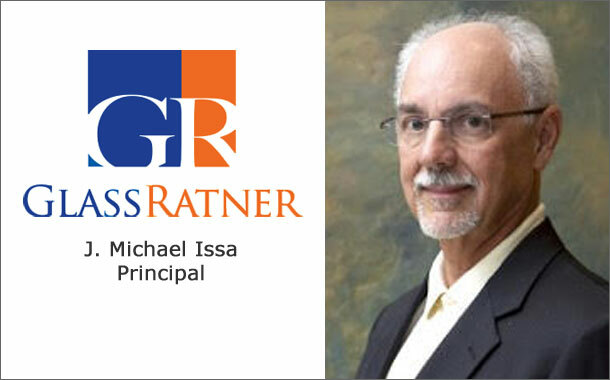 J. Michael Issa is a principal at GlassRatner Advisory & Capital Group, wholly-owned subsidiary of B. Riley Financial, Inc. (NASDAQ: RILY). He is a CPA and a Chapter 11 Bankruptcy Trustee in the Central District of California. Mr. Issa is a well-known authority on automotive dealerships, working on dozens of transactions in his multi-decade career. He is a former banker as well as a court appointed fiduciary in corporate bankruptcies.